Today in our pick of the top tech news, courtesy of our friends at TechRadar, we've got updates on two of the flagship phones heading your way, as well as some funky-looking speakers from Logitech and a new feature that could be heading your way in Spotify. As the official 27 March launch day gets closer and closer, we're learning more and more about the Huawei P20, and today we've got some benchmarking scores to pore over. Testing logs for the upcoming flagship have been spotted online, showing it's just as powerful as the Huawei Mate 10 Pro, though not quite up to the level of the iPhone X in terms of performance. In a couple of weeks, we can start testing it out for ourselves. 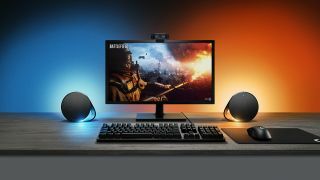 A nice pair of light-up speakers can really add some atmosphere to your gaming experience, as well as crisp audio, and the Logitech G560 set might be just what you're looking for. The kit offers four different lighting zones to play around with, and the speakers can even sync up with certain games, so you get a blast of colour at the same time as a blast of sound. The speakers are available now for $199 (which is about £140). We can talk to all kinds of gadgets nowadays, from phones to speakers, and Spotify has confirmed that it's testing voice controls with a small number of users – so you can speak out the name of the band you want to listen to rather than tapping on your phone's screen, which could come in handy. Will this feature get rolled out to the rest of us soon? Does this mean Spotify is also working on a smart speaker of its own? We'll have to wait and see. Since the distinctive notch appeared on the front of the new iPhone X, more and more Android manufacturers have been following the trend. The latest rumour around the upcoming LG G7 handset is that the notch is going to be optional – you can bring it up with a software overlay, or leave it out. It's a rather strange move, but it does seem to offer more screen space in certain situations, and we know that Android P includes notch support. Google just announced it's making a lot more of its maps data and augmented reality tech available to developers, specifically anyone who wants to develop location-based games – think Pokémon Go and the like. The move means that you're likely to see a lot more mobile games that take advantage of the local landscape around you, so you could be battling aliens in your home town or having to hit certain waypoints to collect your loot.